This oceanic take on the Oasis Water Node Trap has been decorated to look more commonplace amongst the flora of the ocean floor. Sea foliage provides the perfect cover, and it is also effective at confusing land-based mice who have never seen such a sight! The Coral Oasis Skin can be used on the Oasis Water Node Trap. The trap's stats (power, power bonus, attraction bonus, etc.) are not changed. The Coral Oasis Skin can be purchased at the Sunken City Trapsmith for 180,000 gold, 100 Sand Dollars, 50 Barnacles, 50 Mouse Scales, and 50 Damaged Coral Fragments. It can be refunded at the same location for 30,000 gold. The Coral Oasis Skin can be traded on the Marketplace or through Give To Friends. 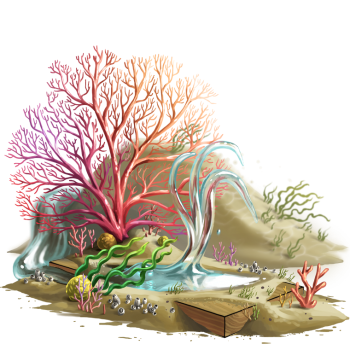 2 July 2014: The Coral Oasis Skin was released with the introduction of the Sunken City, although it could not be purchased until 29 July 2014. This page was last edited on 9 December 2017, at 10:29.